High Quality Content by WIKIPEDIA articles! 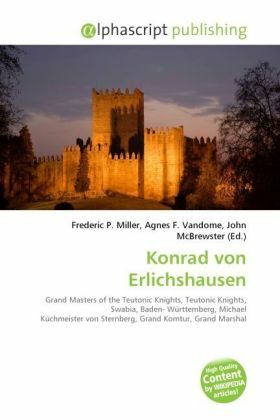 Konrad von Erlichshausen (died 7 November 1449) was the 30th Grand Master of the Teutonic Knights, serving from 1441-49. Konrad came from Ellrichshausen in Swabia, now part of Satteldorf in Baden-Württemberg. Early in his career he was a close ally of Michael Küchmeister von Sternberg and later on he held the positions of Grand Komtur and Grand Marshal. After its defeat in the Battle of Grunwald (1410) and the resulting First Peace of Thorn (1411), the Order's power declined both in and outside their Ordenstaat. Credits had to be sought from abroad and high taxes caused opposition within Prussia and its Hanseatic cities. Konrad's opinion was in conflict with Grand Master Paul von Rusdorf, which caused his demotion to a lesser position. He led the opposition in the Order which forced von Rusdorf to resign as the Grand Master of the Teutonic Order on 2 January 1441. After being chosen Grand Master in 1441, Konrad tried to reform the Teutonic Order and tried to negotiate a compromise with the Prussian cities and gentry who had formed the Prussian Confederation.